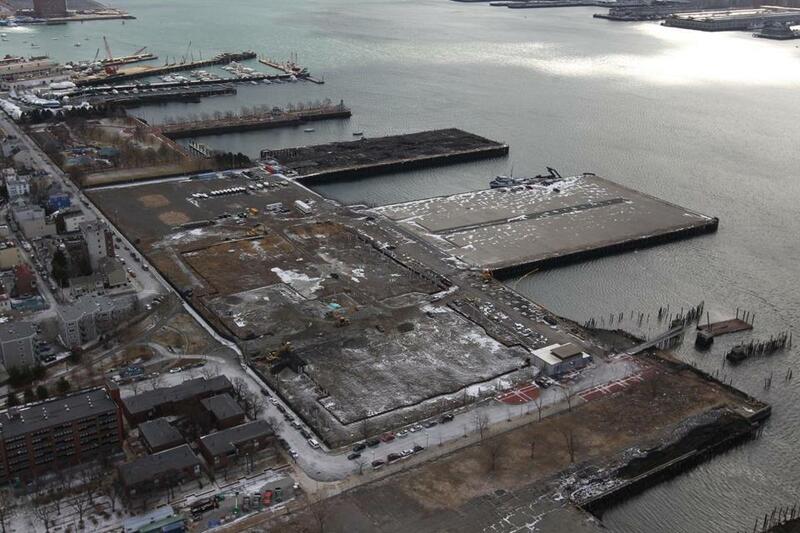 A new development by Roseland Property on the waterfront in East Boston will eventually include more than 550 apartments and 70,000 square feet of retail and civic space. East Boston is finally getting in on the building boom sweeping across the rest of the city. Scores of residential units are under construction and hundreds more are being planned along the neighborhood’s waterfront, which features stunning views of Boston Harbor and the city’s downtown skyline. Maverick Square, for decades a gritty backwater, is also showing signs of life following a $56 million rehabilitation of its MBTA station, construction of a neighborhood health center, and an influx of new retailers. And late last week, Boston regulators approved construction of a Hilton Garden Inn and two retail buildings off William F. McClellan Highway. “East Boston is seeing great momentum, and these projects are just the start,” said Mayor Thomas M. Menino, whose administration has invested millions of dollars in public money to spur the neighborhood’s revitalization. For more than a decade, East Boston has been talked about as Boston’s next boomtown. In addition to possibly hosting a massive casino and entertainment complex at Suffolk Downs, it has convenient public transit access, several new public parks, and enough attractive waterfront property to host a mini city of homes, restaurants, stores, and offices. But the neighborhood’s renaissance was put on hold during the recent economic downturn, leaving its broken-down piers to sit idle in the water. Only recently has it come back to life. Developer Roseland Property Co. started construction last month on a 176-unit apartment building called Portside at Pier One near Maverick Square. That first, five-story building is part of a larger complex that will eventually include more then 550 apartments and 70,000 square feet of retail and civic space. The project is planned to include a parking garage, a fitness center, a theater, and concierge service. The hotel will include 177 rooms and help enliven six acres of vacant land at McClellan Highway and Boardman Street. The project will also bring a new restaurant to the property and at least one other storefront. Karam said East Boston has all the raw materials to attract the kind of redevelopment that transformed neighborhoods such as the South End, Charlestown, and the South Boston Waterfront. “With its proximity to downtown and the employment centers, there is no reason East Boston can’t follow the same path as those other neighborhoods,” he said. Menino has made the neighborhood’s revitalization a priority in recent years. Last year, the city began construction of a $17.4 million public library branch in East Boston, and the mayor has also sought to improve water transit to the neighborhood by building a new marine terminal near Maverick Square. In addition, city planners are seeking to expand the East Boston Greenway, a string of public parks constructed on former Big Dig parcels and other property. The goal is to link parks near Maverick Square to the Belle Isle and Wood Island marshes, creating a continuous walking and biking pathway across the neighborhood.